This is a slightly different article, in that I am sharing my thoughts on how a Ground Level Tree Assessment (GLTA) should be carried out, from the perspective of someone who climbs trees to carry out endoscope inspections of potential roost features. Tree climbing is fun and I enjoy it, but it is also dangerous and we only climb a tree if a) we feel that it is really necessary; and, b) most importantly, that it is safe to do so. For those of you who don’t know, a GLTA aims to classify the potential of a tree to support roosting bats, based on potential roost features present. These may be woodpecker holes, splits or cracks, or cavities within the trunk. If a feature appears to lead into a cavity and has potential to support roosting bats on a regular basis, then further survey is recommended. These can be emergence or re-entry surveys, but aerial tree climbing inspections are much more efficient. Sending out climbers to find trees in a woodland with no grid references or photos. When you get in the mind-set to climb a lot of trees and you lug lots of equipment around and then actually have to climb very few because it turns out that with the use of a torch and binoculars, most of the features can be ruled out. Surveyors not noting the fact that there are electricity or telegraph cables running through the canopy. How to carry out a GLTA? Equipment: close-focusing binoculars, a decent torch (Clu-lite, LED Lenser etc. ), survey form. DBH tape to take measurements of the diameter of the tree at breast height (not essential). Method: begin by observing the tree from a distance and note its general condition. Slowly walk towards the tree and start circling it. Does it look healthy? Is there any deadwood within the canopy? (Dead twigs don’t really count). Are there any hanging branches? (These can result in a tree that is unsafe to climb and be potentially dangerous for the surveyor). Do cables run through the canopy? Are there any fungal fruiting bodies at the base of the tree or higher up? Once you are closer to the tree, start looking from the ground upwards and make a note of any features that you see. Then once you have looked at the tree from that angle and written your notes, move to the next ‘side’ of the tree. The whole tree should be inspected from different angles and you should move around to make sure you have the best possible view of any given feature, although this may not always be possible so make a note of any access restrictions within your survey limitations. Survey information: the most important part, particularly if further survey will be carried out by different people. Grid reference – preferably a ten figure one. Description of the feature – most importantly, the height and orientation. Further actions – can the feature be inspected from ground level? Or from a ladder? Or does it definitely need climbing? And one more thing: There is no such thing as a ‘rot hole’. Tree climbers tend to use the proper arboricultural terminology for features within a tree: hazard beam, frost crack, knot hole. 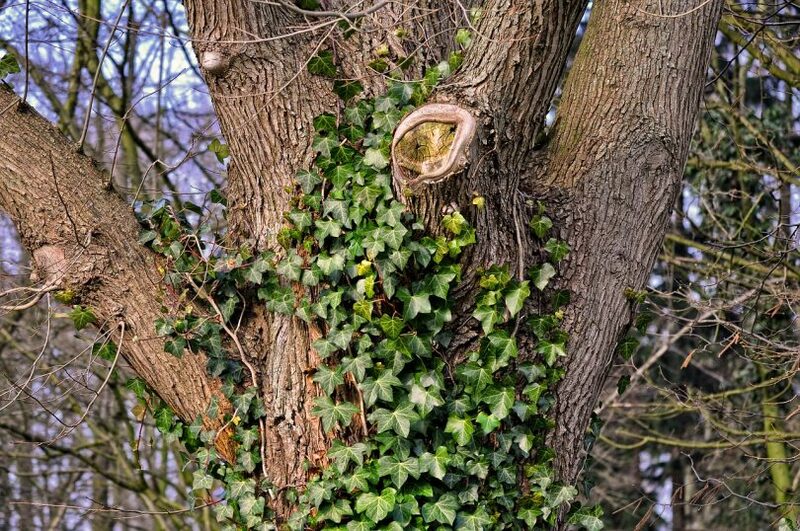 Tree surgeons will be the ones who will carry out any remedial or felling works required, so they need to know exactly what features need particular attention. This is much easier for them if survey information is in their language, and it helps to maintain consistency throughout the industry. * Ivy cover as a feature on its own does not necessarily equate to high roost potential. A ‘high’ classification is for a feature that may support a maternity or hibernation roost. I’m not saying some bats won’t make use of thicker ivy stems that are closely woven to form crevices and cavities, but young, thin and sparse ivy stems do not count. ** If you think a feature may lead into a cavity then mark it as moderate, as this will trigger further survey. If, by using your very useful torch and binoculars you can see into the back of a feature from ground level and there are no other cavities, it is low potential. About the Author: Rachel Bates (Castle Hill Ecology Ltd) is a freelance ecologist who finds bats particularly interesting and can often be found out with the local bat group when she isn’t carrying out bat surveys for work. She tries to combine her wanderlust with learning more about bats abroad when she can and has joined several overseas bat research trips to date. She does have a life outside of bats, enjoying hiking, photography, baking and getting lost in fantasy fiction. My main issue with these surveys is that in many cases it isn’t possible to tell from the ground whether there might be cavities higher up but surveyors will often then class them as no or low potential instead of having a “don’t know” category, needing further investigation.